The North West office of Dow Schofield Watts has moved into striking new office space on one of the largest business parks in the North West, Daresbury Park. Dow Schofield Watts purchased the two-story office block at the end of 2014, in a £1.25 million deal and have undertaken a substantial programme of refurbishment. After six months of refurbishment work and a fit-out by Flexible Business Interiors, the firm’s new 6,000 square foot home has been transformed into a stylish office space complete with a large seminar room, eight “feature” meeting rooms decorated with distinctive artwork supplied by the more creative members of the Dow Schofield Watts team, video conferencing facilities and further “Costa” coffee type areas to encourage more collaborative working, leading the way to make it easier for “water cooler” chats and more informal dialogue-growth between each of the core businesses. 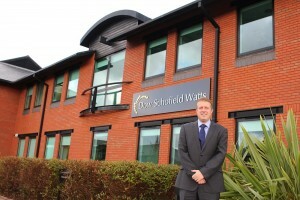 The move has been required to accommodate the rapid growth of Dow Schofield Watts who during the last five years have seen the number of professional staff increase from 12 to 41. Dow Schofield Watts’s suite of professional services includes Corporate Finance, VAT, Business Recovery, Forensic and Transaction Services. Across the region, Dow Schofield Watts is probably the largest and most experienced corporate finance advisory team. Since the business started in 2002, the corporate finance team has completed 159 deals with a combined value of £3.2 billion.